In today’s A Lab Aloft, International Space Station researcher, Mark Weislogel, Ph.D., boils down why brews served in microgravity will percolate better science than coffee, thanks to the Space Cup. You may have heard the “caffeine buzz” around the Internet about the ISSpresso machine that recently launched to the International Space Station. It would be out of this world indeed to have a cup to go along with it. So we designed, fabricated, tested, and flight qualified one. In fact six such cups are now on the space station and ready for action. With real science backing the design, our microgravity coffee cup will do more than lift espresso to astronauts’ lips — it will also provide data on the passive movement of complex fluids as part of the Capillary Beverage investigation. The results will confirm and direct math models that help engineers exploit capillary fluid physics (capillary fluidics) to control how liquids move by designing containers specific to the task at hand. Whether getting the last drop of fuel for a rocket engine or delivering the perfect dose of medication to a patient, there are real Earth benefits behind the brew. On Earth, gravity is responsible for making bubbles rise and liquids fall. Such mechanisms vanish in the weightless environment of orbiting spacecraft. In fact, in microgravity there is no concept notion of floating or sinking, or up or down. Other forces such as surface tension that are normally overwhelmed by gravity on Earth rise to dominate liquid behavior. In a spacecraft, if the effects of surface tension are not understood, liquids (e.g., water, fuel) can be just about anywhere in the container that holds them. Similarly, the gas (e.g., oxygen, nitrogen) in such containers can freely range, too. You’re in for a challenge if you want to find where these fluids are and use them. Even if you just want to drink them. This is why in space you’ll only see astronauts drinking from bags with straws so that they can completely collapse the bag to assure the liquids come out. From a practical safety perspective, the bags also provide a level of containment. When my laboratory heard of ESA astronaut Samantha Cristoforetti and the Italian Space Agency’s espresso machine investigation (ISSpresso) going to space, it got us thinking about that beautifully complex drink and how it would behave differently — especially whether the coffee would develop a crema or not. Currently, we don’t believe so because the bubbles that form during the espresso brew process won’t naturally rise to the surface due to absence of buoyancy in the microgravity environment. Other weaker forces often masked by gravity are present and will likely play an unearthly role in what happens, making the espresso fun to observe. It will be a different kind of fun altogether to get real science out of the process at the same time. In a normal cup of espresso, carbon dioxide bubbles release and collect to form a crema. Some of the bubbles adhere to the walls of the cup, while the remainder rise and stratify due to their size in layers we refer to as foam. Steam rises above the surface of the crema in part condensing in an advancing front on the inside surfaces of the cup. The cup cools by natural convection and the aromatics waft at rates determined by buoyancy. These processes are completely induced by gravity! When the influence of gravity is greatly reduced, as it is aboard orbiting spacecraft, not much of this stuff is going to happen. This will be unusual for the astronauts. Even the smell of the coffee diffusing through the crema is driven by natural convection currents in the air, which are absent in the microgravity environment. So the simple, every day fluid physics taking place in your daily coffee are highly dependent on gravity. 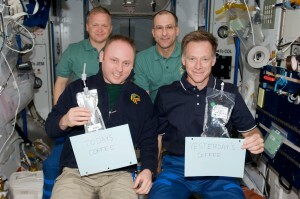 From taste to smell, we anticipate what may even be a disappointing cup of coffee in space. But only the astronauts will know, and we will have to take their word for it in the hopes of one day trying this for ourselves. You can imagine how many variables are at play for the drinking experience from a human factors perspective, but gravity influences many of these, too. Sinus drainage, saliva migration, time aloft, and others are reasonable microgravity-related parameters affecting one’s response to the drinking experience in space. We designed the Space Cup with the central objective of delivering the liquid passively to the lip of the cup. To do this we exploit surface tension, wetting conditions, and the special geometry of the cup itself. We have yet to learn the human-cup interaction in microgravity. The cup design forces the drinker’s nose directly over the fluid contents. But since the aromatics do not rise, one might expect a rather concentrated dose upon the first whiff. Maybe this won’t be a big deal since astronauts report a reduced sense of smell while in space, due to somewhat clogged sinuses. This is presumably due to the headward fluid redistribution that occurs in spaceflight. We were highly motivated to make the cup transparent so we could observe all of the fluid physics going on in the process. It may sound nerdy, but that’s what we do—we study microgravity fluid physics in hopes of designing more reliable fluid systems for future spacecraft, and more effective fluid systems for applications on Earth. Touching your lips to the rim of the cup establishes a capillary connection, almost like the wicking of water through a paper towel, allowing the drinker access to the entire contents. 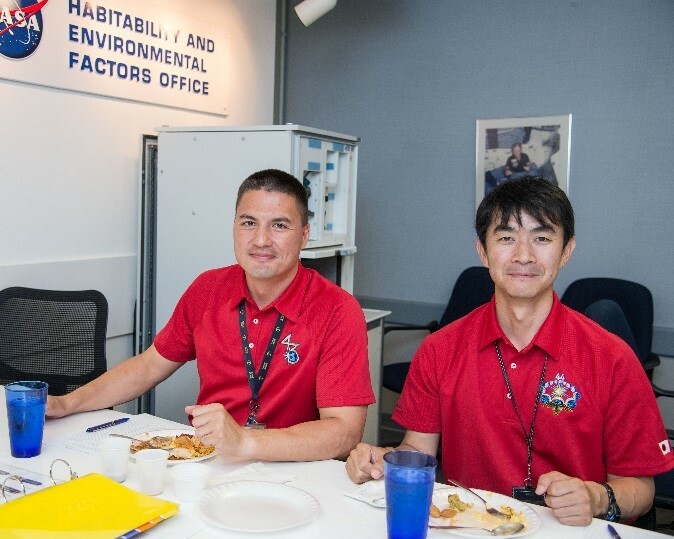 My colleagues and I have been doing research aboard station for more than 10 years. During the course of hundreds and hundreds of experiments, we’ve been developing the mathematical predictive tools and computational tools for such passive capillary fluidic processes. Now we are in a place to develop designs for systems in space — systems with promises of high reliability because they perform their function passively, without moving parts. Examples include things like urine treatment and processing, and systems to close the water cycle helping to enable truly long duration crewed space exploration. These same tools also help us with fuel systems, cooling systems, water processing equipment for plant and animal habitats, and much more. Perfecting these systems can also help us prevent disasters in orbit or on long-duration missions such as the journey to Mars. For example, the primary oxygen supply systems on many spacecraft use electrolysis. If the system gets a single air bubble lodged within its tubing, it can shut down until the bubble is found and removed. To get a sense of working with these types of systems in space, you need an understanding of capillary phenomena from studies, believe it or not, like Capillary Beverage. While fun, this study has plenty of design research behind it. Many of the aspects of our fluid physics research in microgravity are present in this simple cup demonstration — the effects of wetting, the effects of geometry, and the effects of fluid properties, especially surface tension. The results could provide information useful to engineers who design fuel tanks for commercial satellites, for instance. If you can find all your fuel, you can save costs and maximize the mission duration. With this cup we can also study complex fluids that we have not previously addressed. For example, just adding sugar or milk to tea is expected to radically change the performance of the process of how the fluids move. We’ll approach this systematically aboard the space station. We’re starting off with water, then clear juice, then tea, tea with sugar, etc., including complex drinks like cocoa, a chocolate breakfast drink, and even a peach-mango smoothie. Undissolved solids, dissolved gasses, foams, free bubbles, surfactants, varying viscosities, temperature effects and more — all in little transparent 3D printed cups used by astronauts to drink on the space station. This progression from simple to complex beverages will give us a wealth of data — data which we aim to apply not just in space, but on Earth, too. The astronaut(s) will set up the experiment near the galley, position the cup, camera, and lighting for orthogonal views (views at right angles), and a variety of experiments will be performed using the HD video as our quantitative data source. For example, when the astronaut fills the cup, the filing process is research. When the astronaut drains the cup, the draining is research. The static and dynamic interface shapes tell us everything we need to know, from wetting conditions to stability, to visco-capillary interaction. This is the exciting part for us! We see the profile of the interface, we watch particles and bubbles as flow tracers, we get velocities and volumetric drain rates, and all as functions of what the astronaut is doing — enjoying a cup of coffee! Astronaut Kjell Lindgren is planning to take up plenty of his own espresso during Expeditions 44/45. We have plenty to look forward to. With this cup, most everything is taken care of passively by the shape of the cup. There isn’t a straight line in it. There are no moving parts. Wouldn’t it be nice if all the fluid systems on spacecraft worked like that? We know it would result in less worry on the ground. The simpler things are, the more robust their function and the less time is needed for maintenance. Check out this video about our first version of a zero-g coffee cup. What we are learning here is not just for space. All the design tools we are developing are applicable to small fluidic systems on Earth, too. For example, portable point-of-care medical diagnostic devices exploit capillary flow to passively move a very small sample of blood to any variety of regions on a testing chip. That makes it possible to diagnose infectious diseases in places where there is no power or where power is unreliable. It also reduces the time between sample collection and diagnosis and, therefore, initiation of treatment. We will report more on this connection in the future. The next time you brew a cup of your favorite coffee, imagine what it might be like to take a sip from the Capillary Beverage cup aboard the International Space Station while watching the Earth go by. Then consider the fluids research off the Earth, that can make a difference right here on the Earth. 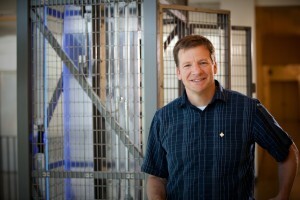 Mark Weislogel, Ph.D., is senior scientist and vice president of IRPI LLC and professor Mechanical Engineering at Portland State University. 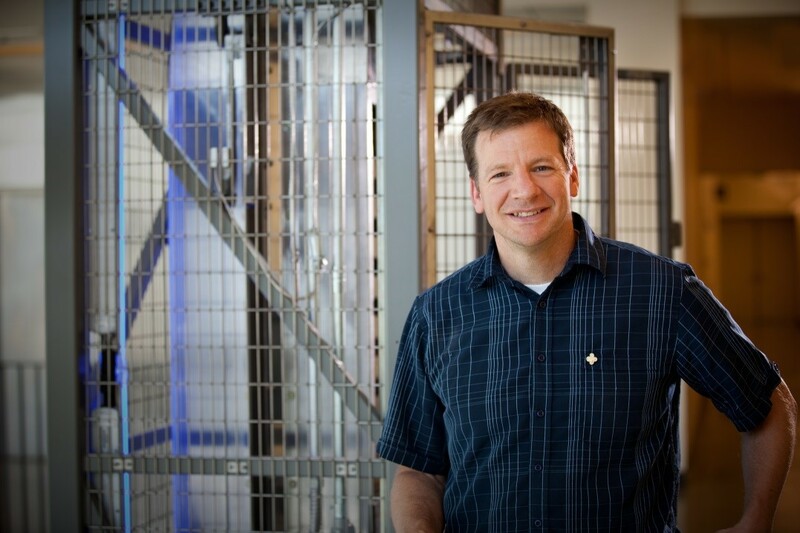 He was founded in microgravity fluid physics while employed at NASA’s Glenn Research Center. Whether in the private sector or academia, Weislogel has since continued to make extensive use of NASA ground-based low-gravity facilities and has completed investigations aboard space shuttles, the Russian Mir Space Station, and the International Space Station. He led the design of the Dryden Drop Tower, which has conducted over 4,000 drop tests and continue at a rate of over 1,000/year. Current efforts are directed to research, development, and delivery of advanced fluid systems for spacecraft. Dear NASA & Astronauts; I did not know that the smell is deprived. Did Samantha miss the smell of the delicious crema & espresso brewing? I am a regular vanilla latte drinker. That is amazing and fantastic that NASA is conducting such experiments in space. I love NASA and thank you to the astronauts for their service! Sincerely, KC. I found that most interesting thank you. I would miss I’m sure that smell of coffee brewing. But would definitely love the chance to experience what those folks are aboard the ISS. Amazing to see every day pleasures available to space-inhabitants! The adventures continue. 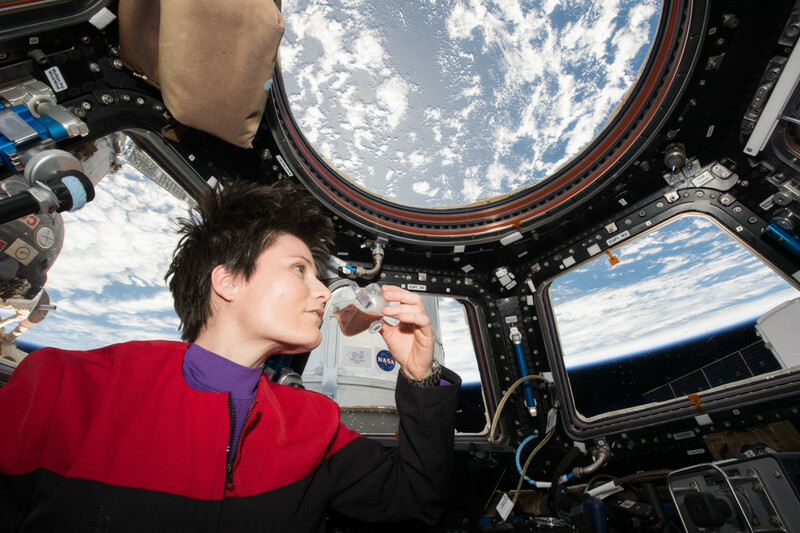 Congratulation for first ISSpresso in Space , Samantha the best coffe maker – Samantha fantastic Barista ! I understand that there may be IP issues, but are there any plans to share STLs of these coffee cups so we can print some at home? Thanks in advance. OK, so when will the zero-G espresso cup be available for us earth bound types? Definite market among us space enthusiasts. So, Ms Christoforetti steers the project and you put up images of male astronauts. Talk about “mansplaining”. This blog published before the activity occurred on orbit, so no pictures were available. We will update when new images are available. Would the use of a sieve help control the amount/size of bubbles desired in drinks and foods? for example, in using yeast for making breads, or for creating foams for insulation, or for extracting bubbles where they are not wanted? Cohesive and surface tension of the liquid could be calculated and cause bubbles to “pop” or limit growth…. maybe?